Ephesus (Ancient Greek: Ἔφεσος; Turkish: Efes) was an ancient Greek city on the west coast of Anatolia, now in Turkey. It was one of the twelve cities of the Ionian League. The Apostle Paul is said to have addressed an epistle to the Christians of the city., and it is now known as the Epistle to the Ephesians in the New Testament. The site still possesses many well preserved Roman ruins side by side with rich history. Most significant are the odeon, used as a concert hall and city council with the capacity of 1.500 people, Temple of Hadrian dating back to the second century where one of the best sculpture craftsmanship can be seen, Curettes Street hosting many monuments and countless colums on the sides of its marble paved ground, a fountain dedicated to Emperor Trajan where a part of a remaining statue shows us that Romans knew the round shape of the world in the first century AD, and latrines (toilets) where it can be seen how they cared about public sanity. Two other of Ephesus's outstanding monuments hold importance not just for their home city also for world's cultural and architectural heritage. The first one is the library of Celsus which is located at the end of the Curettes Street. The library looks like a two storeyed building seen from the facade but as we know it former had three stories inside. The facade shows a rare found craftsmanship. Also the library was the third biggest library of the ancient world, after the libraries of Alexandria and Pergamon. Anyone who stands in front of this monumental building can understand why did it take twenty years (115 AD to 135 AD) to complete it. The second one is Ephesus' grand theatre which had the capacity of 25.000 spectators. It was not just a place of art also as we know it was used for animal and gladiator fights. With its great dimensions it makes one think about how small my moment in time really is. It's one of the sacred ruins of Ephesus, according to the Acts of the Apostles (19:23-41), the theater was the site of the "riot of the silversmiths" in which those who made silver figures of Artemis the pagan godess of the city rioted because Paul's preaching was bad for business. 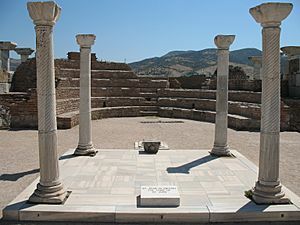 In the 1st century AD, the Apostle Paul spent over three years in Ephesus and he sermonized many times, disapproving pagan worship, in this theater. Ephesus was an important centre for Early Christianity from the AD 50s. From AD 52–54, the apostle Paul lived in Ephesus, working with the congregation and apparently organizing missionary activity into the hinterlands. 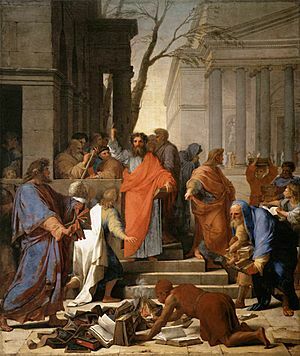 Initially, according to the Acts of the Apostles, Paul attended the Jewish synagogue in Ephesus, but after three months he became frustrated with the stubbornness or hardness of heart of some of the Jews, and moved his base to the school of Tyrannus (Acts 19:9). The Jamieson-Fausset-Brown Bible Commentary reminds readers that the unbelief of "some" (Greek: τινες) implies that "others, probably a large number, believed" and therefore there must have been a community of Jewish Christians in Ephesus. Paul introduced about twelve men to the 'baptism with the Holy Spirit' who had previously only experienced the baptism of John the Baptist (Acts 19:1-7), and later became embroiled in a dispute with some artisans whose livelihood depended on selling statuettes of Artemis (Latin: Diana) in the Temple of Artemis (Acts 19:23–41). Between 53 and 57 AD Paul wrote the letter 1 Corinthians from Ephesus (possibly from the 'Paul tower' near the harbour, where he was imprisoned for a short time). Later, Paul wrote the Epistle to the Ephesians while he was in prison in Rome (around 62 AD). Roman Asia was associated with John, one of the chief apostles, and the Gospel of John might have been written in Ephesus, c 90–100. 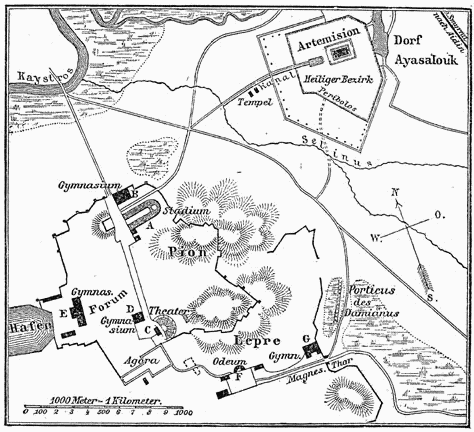 Ephesus was one of the seven cities addressed in the Book of Revelation, indicating that the church at Ephesus was strong. Two decades later, the church at Ephesus was still important enough to be addressed by a letter written by Bishop Ignatius of Antioch to the Ephesians in the early 2nd century AD, that begins with, "Ignatius, who is also called Theophorus, to the Church which is at Ephesus, in Asia, deservedly most happy, being blessed in the greatness and fullness of God the Father, and predestinated before the beginning of time, that it should be always for an enduring and unchangeable glory" (Letter to the Ephesians). The church at Ephesus had given their support for Ignatius, who was taken to Rome for execution. A legend, which was first mentioned by Epiphanius of Salamis in the 4th century AD, purported that Mary may have spent the last years of her life in Ephesus. The Ephesians derived the argument from John's presence in the city, and Jesus’ instructions to John to take care of Mary after his death. Epiphanius, however, was keen to point out that, while the Bible says John was leaving for Asia, it does not say specifically that Mary went with him. He later stated that she was buried in Jerusalem. 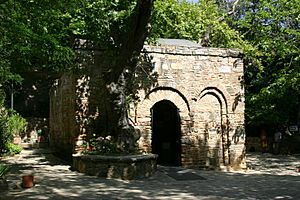 Since the 19th century, The House of the Virgin Mary, about 7 km (4 mi) from Selçuk, has been considered to have been the last home of Mary, mother of Jesus in the Roman Catholic tradition, based on the visions of Sister Anne Catherine Emmerich. It is a popular place of Catholic pilgrimage which has been visited by three recent popes. The Church of Mary near the harbour of Ephesus was the setting for the Third Ecumenical Council in 431, which resulted in the condemnation of Nestorius. A Second Council of Ephesus was held in 449, but its controversial acts were never approved by the Catholics. It came to be called the Robber Council of Ephesus or Robber Synod of Latrocinium by its opponents. 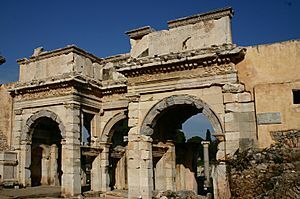 The Gate of Augustus in Ephesus was built to honor the Emperor Augustus and his family. Tomb of John the Apostle at the Basilica of St. John. Ephesus is one of the largest Roman archaeological sites in the eastern Mediterranean. The visible ruins still give some idea of the city's original splendour, and the names associated with the ruins are evocative of its former life. The theatre dominates the view down Harbour Street, which leads to the silted-up harbour. 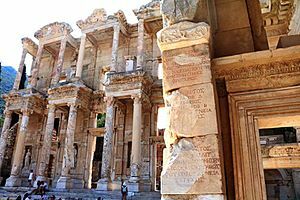 The Library of Celsus, the façade of which has been carefully reconstructed from original pieces, was originally built c. 125 AD in memory of Tiberius Julius Celsus Polemaeanus, an Ancient Greek who served as governor of Roman Asia (105–107) in the Roman Empire. Celsus paid for the construction of the library with his own personal wealth and is buried in a sarcophagus beneath it. The library was mostly built by his son Gaius Julius Aquila and once held nearly 12,000 scrolls. Designed with an exaggerated entrance — so as to enhance its perceived size, speculate many historians — the building faces east so that the reading rooms could make best use of the morning light. At an estimated 25,000 seating capacity, the theatre is believed to be the largest in the ancient world. This open-air theatre was used initially for drama, but during later Roman times gladiatorial combats were also held on its stage; the first archaeological evidence of a gladiator graveyard was found in May 2007. There were two agoras, one for commercial and one for state business. Ephesus also had several major bath complexes, built at various times while the city was under Roman rule. The city had one of the most advanced aqueduct systems in the ancient world, with at least six aqueducts of various sizes supplying different areas of the city. They fed a number of water mills, one of which has been identified as a sawmill for marble. The Odeon was a small roofed theatre constructed by Vedius Antonius and his wife around 150 AD. It was a small salon for plays and concerts, seating about 1,500 people. There were 22 stairs in the theatre. The upper part of the theatre was decorated with red granite pillars in the Corinthian style. The entrances were at both sides of the stage and reached by a few steps. The Temple of Hadrian dates from the 2nd century but underwent repairs in the 4th century and has been reerected from the surviving architectural fragments. The reliefs in the upper sections are casts, the originals now being exhibited in the Ephesus Archaeological Museum. A number of figures are depicted in the reliefs, including the emperor Theodosius I with his wife and eldest son. The temple was depicted on the reverse of the Turkish 20 million lira banknote of 2001–2005 and of the 20 new lira banknote of 2005–2009. 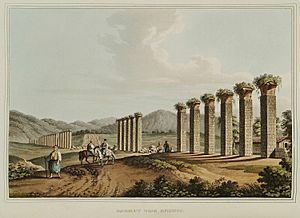 The Temple of the Sebastoi (sometimes called the Temple of Domitian), dedicated to the Flavian dynasty, was one of the largest temples in the city. It was erected on a pseudodipteral plan with 8 × 13 columns. The temple and its statue are some of the few remains connected with Domitian. The Tomb/Fountain of Pollio was erected in 97 AD in honour of C. Sextilius Pollio, who constructed the Marnas aqueduct, by Offilius Proculus. It has a concave façade. A part of the site, Basilica of St. John, was built in the 6th century AD, under emperor Justinian I, over the supposed site of the apostle's tomb. It is now surrounded by Selçuk. Ephesus is believed to be the city of the Seven Sleepers. The story of the Seven Sleepers, who are considered saints by Catholics and Orthodox Christians and whose story is also mentioned in the Qur'an, tells that they were persecuted because of their monotheistic belief in God and that they slept in a cave near Ephesus for centuries. Site of the Temple of Artemis in the town of Selçuk, near Ephesus. Street scene at the archeological excavations at Ephesus. 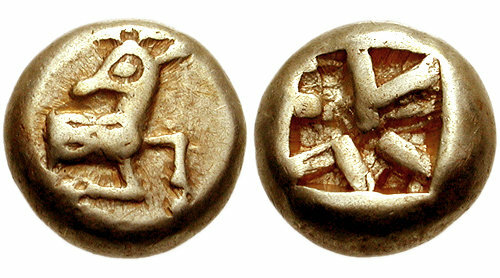 Electrum coin from Ephesus, 620-600 BC. Obverse: Forepart of stag. Reverse: Square incuse punch. The 'terrace houses' at Ephesus, showing how the wealthy lived during the Roman period. Eventually the harbour became silted up, and the city lost its natural resources. Theater and harbour street. Like the ancient city Miletus nearby, in antiquity the city possessed a natural harbour at the end of the street. Artist Simon Kozhin Ephesus. Ruins Temple of Hadrian. The İsa Bey Mosque constructed in 1374–75, is one of the oldest and most impressive works of architectural art remaining from the Anatolian beyliks. Ephesus Facts for Kids. Kiddle Encyclopedia. This page was last modified on 18 April 2019, at 20:49.